CII Inquizzitive, CII’s annual HR quiz schedule for 2016. This poem, which traces the evolution of the Godrej Group in the early days, was read by Nadir Godrej in 1997, the centenary of the Group’s founding, at the inauguration of a research centre named after Dr Burjor P Godrej, who pioneered the soap and oleochemical industry. He was soon sent to Zanzibar. He told himself enough’s enough. He quit the law and looked for work. The Godrej group got its start. His first attempts were not so smart. Decides there is no demand. This early failure was no block. He moved on to the humble lock. And soon sold out all his stock. Likely not to have the desired effect. That made San Francisco shake. Is there no end to bad luck? In fierce fires were unscathed. His safes survived ordeal by fire. Soap at that time was made from fat. But Hindus couldn’t live with that. He made a soap from vegetable oil. We owe a debt of gratitude. Today we have this celebration. With Burjorji it found new light. An innovation of great scope. His fatty acids truly impressed. Alpha olefins were his quirk. The oleochemicals that we now show. In his honour we dedicate this lab. You still might see an empty slab. Of sloppy thought and superstition. And pull us out of our stagnation. For details, please visit Tata Crucible website. To prepare for quizzes, please check our offerings. A section of the first steel rail track rolled that from the Tata Steel (then the Tata Iron & Steel Co. Ltd, Sakchi), Jamshedpur on March 18th 1912 has been reclaimed by the company. The item was set up for sale at the Sotheby’s in London. As per their records, this was cut to be used as a desk weight, and was presented to Robert Crewe-Milnes, 1st Marquis of Crewe (1858-1947) by Tata Steel. This “desk weight” became part of “The Duchess” Indian collection consisting of property and precious objects from the Estate of Mary, the Duchess of Roxburghe. The engraved text on it says “FIRST RAIL ROLLED FROM TATA STEEL BY THE TATA IRON & STEEL CO. LTD. / SAKCHI. INDIA/ MARCH 18TH 1912 / THE RIGHT HONOURABLE MARQUIS OF CREWE K. G.” — possibly done when it was gifted by the Tatas to Robert Crewe-Milnes. Sotheby’s website mentions “LOT SOLD. 9,375 GBP (919,970 INR) (Hammer Price with Buyer’s Premium)“; the press release from the company does not mention the price, though. Established in 1907 as Asia’s first integrated private sector steel company, Tata Steel is among the top global steel companies with a crude steel capacity of nearly 30 million tonnes per annum (MnTPA). It is now the world’s second-most geographically diversified steel producer, with operations in 26 countries and a commercial presence in over 50 countries. 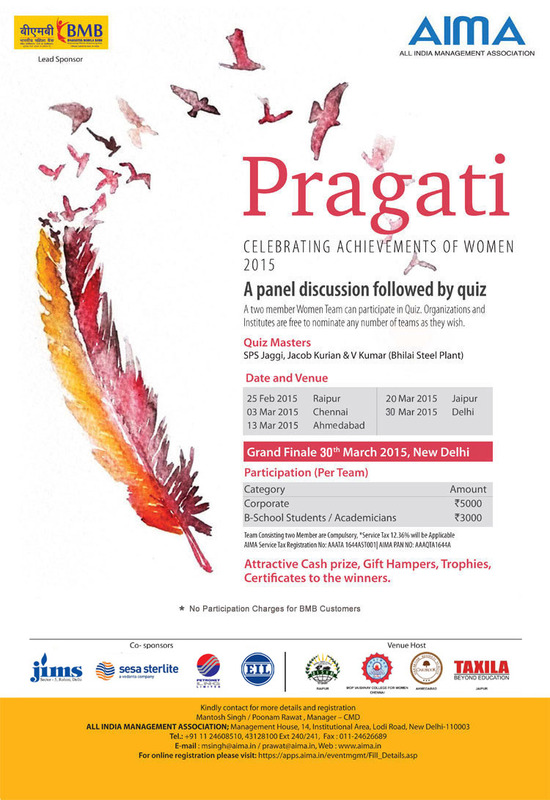 AIMA Pragati Quiz for women is here. BMB is the latest among the Govt.-owned banks. It is the first of its kind in the Banking Industry in India formed with a vision of economic empowerment for women. The New Delhi-based bank was incorporated in 2013. Tagline: Empowering Women. Empowering India. The State Bank of India was formed by the nationalization of the Imperial Bank of India in July 1955. This was the culmination of a IBI’s role in independent India — the debate on its bias towards European businesses and against indigenous entrepreneurs, and the slow pace of Indianization of its staff and management. The Rural Credit Survey Committee saw the proposed State Bank of India as a key part of its integrated system of rural credit. Consequently, the plan to nationalize the Imperial Bank became part of a wider effort to direct the funds of the banking system into certain neglected, but important, sectors of the economy such as agriculture, and spread banking facilities in rural areas. The Imperial Bank was formed as a joint-stock bank in January 1921 by amalgamating the Presidency Banks of Bombay, Calcutta, and Madras. This amalgamation was a response both to the felt need for a bank which would hold government balances and use them to deepen the country’s financial structure, and to the threat which the Presidency Banks felt was likely to emanate from the inroads the London clearing banks were planning to make in India. Almost from its inception, the Imperial Bank had the status of a quasi-central bank, undertaking until the formation of the Reserve Bank of India in 1935, banking functions for the Government of India and other banking institutions and managing the rupee debt of the government. The collapse of the Mughal empire, the uncertainity and political turmoil that followed, and the advent of the colonial power structure shook the existing ‘banking’ system in Indian. Indigenous bankers were eclipsed as Agency Houses took control of large finances. These agency houses enjoyed state patronage and some even established banks. Among the early issuers, the General Bank of Bengal and Bahar (1773-75) was a state sponsored institution set up in participation with local expertise. Its notes enjoyed government patronage. Though successful and profitable, the bank was officially wound up and was short lived. The Bank of Hindostan (1770-1832) was set up by the agency house of Alexander and Company was particularly successful. It survived three panic runs on it. The Bank of Hindostan finally went under when its parent firm M/s Alexander and Co. failed in the commercial crisis of 1832. Official patronage and the acceptance of notes in the payment of revenue was a very important factor in determining the circulation of bank notes. Wide use of bank notes, however, came with the note issues of the semi-government Presidency Banks, notably the Bank of Bengal which was established in 1806 as the Bank of Calcutta with a capital of 50 lakh sicca rupees. These banks were established by Government Charters and had an intimate relationship with the Government. The charter granted to these banks accorded them the privilege of issuing notes for circulation within their circles. Notes issued by the Bank of Bengal can broadly be categorised in 3 broad series viz: the ‘Unifaced’ Series, the ‘Commerce’ Series and the ‘Britannia’ Series. First came the unifaced notes. The Bank of Bengal notes later introduced a vignette represented an allegorical female figure personifying ‘Commerce’ sitting by the quay. The notes were printed on both sides. On the obverse the name of the bank and the denominations were printed in three scripts, viz., Urdu, Bengali and Nagri. On the reverse of such notes was printed a cartouche with ornamentation carrying the name of the Bank. Around the mid nineteenth century, the motif ‘Commerce’ was replaced by ‘Britannia’. The note had intricate patterns and multiple colours to deter forgeries. The second Presidency Bank was established in 1840 in Bombay, which had developed as major commercial centre. The Bank had a checkered history. The crisis resulting from the end of the speculative cotton boom led to the liquidation of Bank of Bombay in 1868. It was however reconstituted in the same year. Notes issued by the Bank of Bombay carried the vignettes of the Town Hall and others the statues of Mountstuart Elphinstone and John Malcolm. The Bank of Madras’s history is officially traced to its formation in 1843 by the merger of Carnatic Bank (Fort St. George, 1788), the Madras Bank (1795) and the Asiatic Bank (1804). Banking in Madras can be traced to 1682 1 when Governor Gyfford and his council who established the Madras Bank — the first bank in India 2. 3 The notes of the Bank of Madras bore the vignette of Sir Thomas Munroe, Governor of Madras (1817-1827). The keyhole in the State Bank Group logo symbolises financial security but strangely it looks exactly like the Kankaria Lake in Ahmedabad.